Your senses will be touched from the moment you enter through the elegant timber gates reminiscent of the beauty of a bygone era to “Ruhamah”. 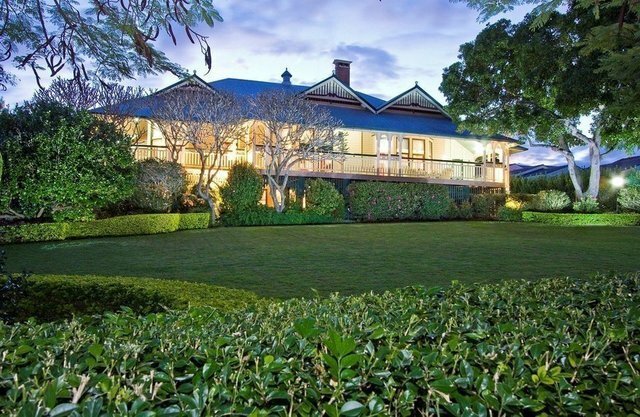 Set across eight titles comprising a massive 4258sqm, “Ruhamah”, meaning love, mercy and compassion, is a unique Edwardian gem which has had just four owners in its 110-year lifetime. The current owners, who have lived in the property for 26 years, have lovingly restored and maintained the home to create an exclusive haven of luxury in the tightly-held dress circle of Hamilton Hill. Beyond the abundant classic timber French doors and windows, to the sprawling verandahs are the most magnificent gardens, an expense of manicured hedges, topiaries, lush planting, championship tennis court and terraces all crowned by mighty Poinciana trees giving a magical sense of privacy and seclusion. A true sanctuary unrivalled and unforgettable! “Ruhamah” with its extensive period features including high pressed-metal ceilings, chandeliers, billiard room with overhead lighting and leadlight turret ceiling and the polished hard-wood floors throughout exudes unrivaled luxury, and still retains the warmth and welcome of a family home. Meticulously restored and revived with expansive living areas, unrivalled chef’s kitchen and outdoor dining complete with tepanyaki terrace off the championship tennis court and indoor pool house with its glass paneled roof enables perfect family entertaining on either an intimate occasion or on an event scale with family and friends. Additions to the home whilst faithful to Edwardian design, have achieved a sympathetic and seamless blend with its period feel, winning the builder, George Moss, a Housing Industry Association award for the project. The grandeur, location and elegance of “Ruhamah” make it one of those refined Queensland properties that are often imitated, but never truly replicated. Located only minutes’ drive from Brisbane’s CBD and airport property of this calibre is very rarely available. To ensure quality and consistency throughout, the owners have also employed the same plumber, electrician, painter and gardener for the entire 26 years of their tenure of the property and they would happily continue with the new residents. It is now sadly time for the current residents of “Ruhamah” to pass the love they have for their home to a new family to create wonderful memories and enjoy the company of friends and family and laughter of children once again.